Here’s an announcement from Montgomery County Community College. They have a lovely art gallery at their West Campus in Pottstown. Check it out this fall! Montgomery County Community College will host the Tenth Annual Scenes of the Schuylkill River Heritage Area Art Show, Aug. 28-Oct. 18, at the Fine Arts Gallery, North Hall, 16 High Street, Pottstown. Sponsored by the Schuylkill River National & State Heritage Area, the art show features 83 original pieces of artwork that highlights the beautiful and unique qualities of the Schuylkill River Heritage Area. Philadelphia artist Susannah Hart Thomer won Best of Show for her watercolor, “Escalation,” which depicts the spiral staircase located outside the Philadelphia Museum of Art leading to the Schuylkill River. 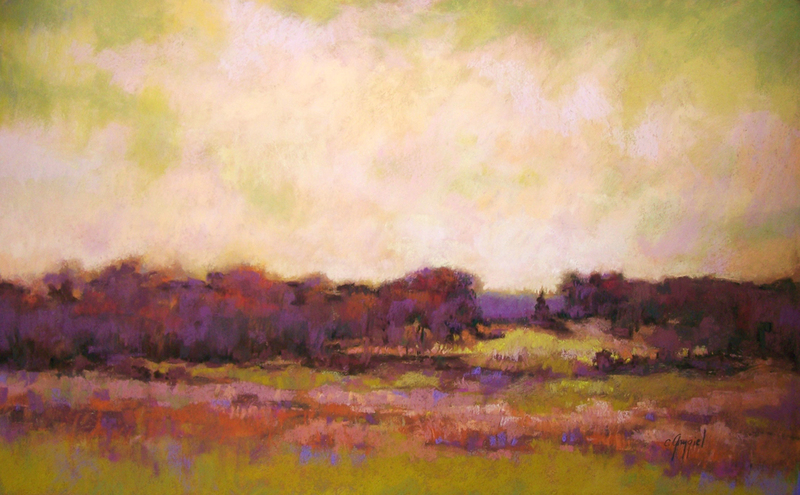 This year’s show was juried by Terry Newman, owner of Newman Galleries in Philadelphia. He spent several hours examining the 107 entries before making his selections. The hours for the MCCC gallery are Monday-Thursday, 8 a.m.-9:30 p.m. and Friday, 8 a.m.-4:30 p.m. Closed weekends. For more information contact the SRHA at 484-945-0200 or the MCCC Galleries Director Holly Cairns at 215-619-7349 or hcairns@mc3.edu. You can help support the arts and art education programs at Montgomery County Community College by becoming a Friend of The Galleries. Donations are tax deductible. For more information, contact the College Foundation at 215-641-6535. Friend and follow MCCC’s arts on facebook.com/DestinationArts. In June, the Annual Schuylkill River Sojourn will celebrate 15 years of celebrating the river. As always, it will bring a flotilla of colorful kayaks and canoes from Schuylkill Haven to Philadelphia from June 1-7, stopping along the way in river towns and parks. The event will be highlighted by programming at every stop on the region’s role in the Civil War. For 15 years, the sojourn has been organized by the Schuylkill River Heritage Area, in Pottstown, in order to draw attention to the river as a beautiful natural, historic and recreational resource. Over that time period, more than 3,000 registrants from 20 states and Canada have participated. This year, over 200 paddlers will take all or part of the weeklong, 112-mile guided canoe/kayak tour. A record number, 59, will make the full trip, launching their kayaks from Schuylkill Haven on June 1, traveling through five-counties (Schuylkill, Berks, Chester, Montgomery and Philadelphia), and bidding goodbye to the river at Philadelphia’s Boat House Row on June 7. Each day, a maximum of 100 boats will be on the water—a sight that is welcomed by people who cheer the sojourners on at bridges and roadsides along the way. The paddlers will visit a number of communities in the region when they stop for lunch and camp out in riverside parks. One reason the Schuylkill River Sojourn is highly regarded is that it has a strong educational emphasis. Each year, programs focusing on the river’s history, culture or environment are incorporated into the lunch and evening stops. The public is invited to attend all programs at evening campsites at no charge. This year’s program theme is A Civil War Odyssey, in conjunction with the 150th anniversary of the Battle of Gettysburg. The first evening, spent at a Port Clinton campsite, sojourners will hear about a regiment of coal miners who tunneled under the enemy. The following night, they’ll watch a one-woman play about Hopewell Furnace during the Civil War era. They’ll learn about the First Defenders at the Gibraltar campsite, see a living history program on Civil War buglers in Pottstown, discover the region’s role in the Underground Railroad in Mont Clare, and meet Gen. George Meade in Conshohocken. (See attached for a list of public programs). Highlighting the lunch programming is a presentation by Gettysburg National Historic Park Superintendent Bob Kirby on the park’s commemoration of the 150th anniversary of Gettysburg. That will take place at 12 p.m. on Monday June 3, in Reading Riverfront Park, in Reading. While the Schuylkill River Sojourn is clearly a recreational endeavor, its primary purpose is to draw attention to the river as this region’s most critical natural resource and a source of drinking water for over 1.5 million people. Studies show that when people paddle a river, they are more likely to be concerned about the health of that river, and to take measures to protect it. The Schuylkill River National and State Heritage Area, managed by the non-profit Schuylkill River Greenway Association, uses conservation, education, recreation, historic and cultural preservation and tourism as tools for community revitalization and economic development. www.schuylkillriver.org/sojourn.aspx. Friday May 10th is the last day to register to avoid the late fee! Register by May 10 to avoid a late fee. Registrations received after May 10 will be automatically charged a $10 late fee. No registrations can be accepted after May 25. There are plenty of spaces available for Tuesday June 4 through Friday June 7. Learn more about these days. Registration is full for the first three days and full-trip. Click here for more information, pricing, itinerary, or photos. Brush up on your paddling skills with this Intro to Kayaking class on May 19. Questions? Call us at 484-945-0200 or email us at info@schuylkillriver.org. The Schuylkill River Sojourn is a 7-day, 112-mile guided paddle from Schuylkill Haven to Boathouse Row in Philadelphia that is organized annually by the Schuylkill River Heritage Area. Participants can register for one day or the entire week. Schuylkill River Sojourn FULL-TRIP registration now online! New this year!! During the first two weeks in April we are accepting registrations from full-trip registrants only. This is being done to ensure that people who wish do the full trip don’t miss out on the first two days, which fill up very quickly. Registration for all other participants will open April 15! For the first time this year we are offering online registration. You can register online by visiting http://www.regonline.com/15thschuylkillriversojourn. After you register online, you will still need to download several waivers and medical forms that must be filled out and mailed in with original signatures. Links to these forms will be available on your registration confirmation form. They can also be found on our website at www.schuylkillriver.org/sojourn/aspx. If you do not wish to register online, you can download a registration form here and mail or fax it to us. For more information, a general itinerary for each day, or to view photos of past sojourns click here or call the Schuylkill River Heritage Area at 484-945-0200. Our 2013 Sojourn outfitter is Doug Chapman, owner of Take it Outdoors Adventure Group. Our guides will once again be Alan and Betsy Quant from Canoe Susquehanna. Rails and River Towns Ride sign-up today! Last day to get free T-shirt! Photo and info courtesy of the Schuylkill River Heritage Area. Support the Schuylkill River Heritage Area with a round-trip bike ride on September 22nd along the Schuylkill River Trail from Pottstown to Birdsboro featuring optional walking tours and a presentation on railroad history. Registration closes at noon on Sept. 21. There will be no day of event registrations. Register by Sept. 5 to receive a free t-shirt and avoid a late fee! Cost: $25 adults (age 16 & up); $20 members; $15 children ages 11-15; 10 & under free. If registering after 9/5/12 cost increases to: $30 adults; $25 members; and $20 children 11-15. Amenities: Refreshments provided. Free T-shirts to all who register by Sept. 5. Ride support and complimentary bike safety checks provided by TriCounty Bicycles, of Pottstown. More information: Call 484-945-0200 or visit www.schuylkillriver.org to learn more. Helmets are required. Due to the width of the trail, no bicycle trailers will be permitted during the event. Three Ride Options to Choose From! 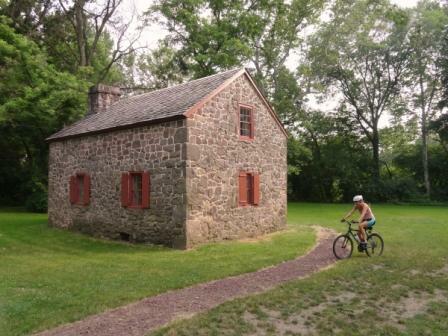 18-mile, round-trip ride from the Schuylkill River Heritage Area headquarters in Pottstown to Birdsboro, with a 45-minute guided walking tour of historic Birdsboro. 9-mile round-trip ride with guided tour of Historic Morlatton Village’s four 18th century buildings. This is the first ride in the Schuylkill River Trail Bike Tour Series, a new multi-year series that supports the Schuylkill River Heritage Area. Each event will feature a unique combination of biking and history. 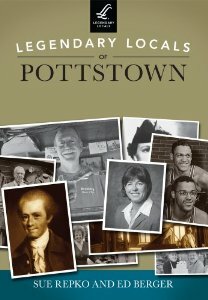 TriCounty Bicycles, Universal Machine Company, Montgomery County Community College, B&G Glass, Gallen Insurance, Boscov’s Department Store, CarePlex, Main Line Financial, Traffic Planning & Design, 422 Commercial Realty, Tim’s Ugly Mug, Vintage Connections, William Knight, Historic Preservation Trust of Berks Co., Barwis Construction, LLC.